18th December, 2018, New Delhi: The Indian telecom sector has off late been in turmoil due to the cut throat competition. The competition is so intense that the telecom operators who once were fierce rivals, recently decided to join hands and merge together. Newer entrants have not made it any easier to operate in the country. Jio has taken to the markets like a storm and their free calling & dirt-cheap data has led to many consumers to ditch their service providers. 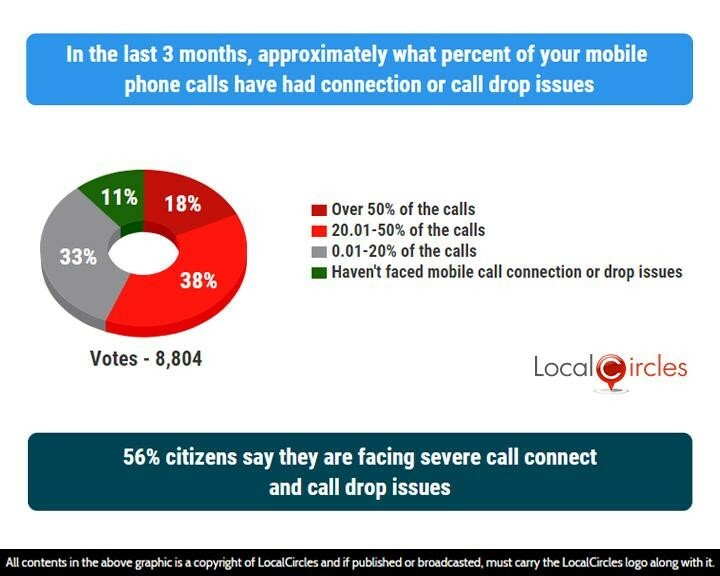 There have been many complaints in the last few months in various circles on LocalCircles about the deteriorating voice quality and call drops. Consumers have been struggling to get a clear signal and many have admitted to running around the room and to balconies to find those divine ‘5 network bars’ on their phone. 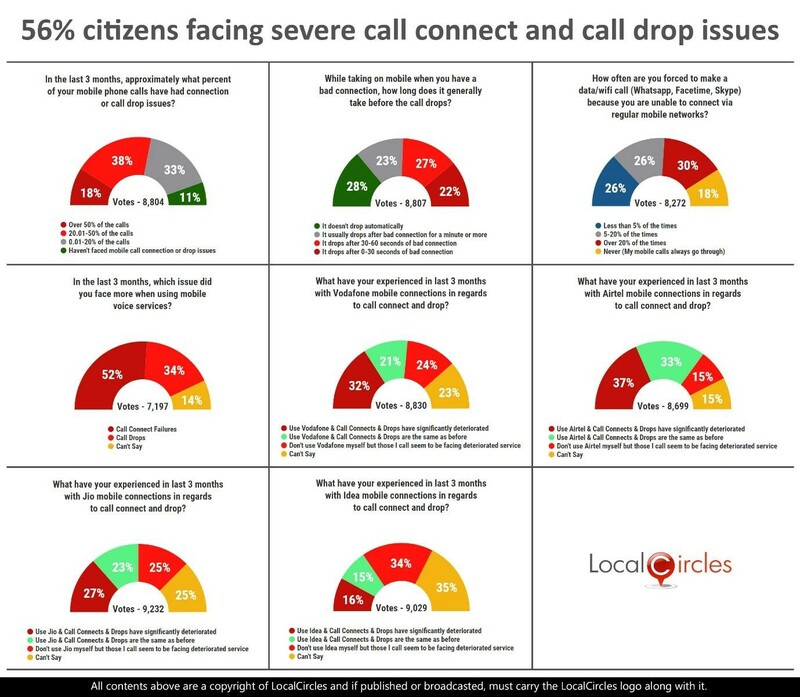 LocalCircles conducted a large survey to ask citizens how their recent experience has been with the telecom service providers in the country. More than 59,000 votes from 32,000 unique participants were polled from 240 cities and towns across India. The first question asked in the last 3 months, approximately what percentage of your mobile phone calls have had connection or call drop issues. 18% said over 50% of their calls had connection or call drop issues 38% said 20%-50% of their calls had issues while 33% said up to 20% of their calls had connection issues. 11% said they have not faced mobile call connection or drop issues. Government recently said that it will discuss the issues of fibre first and digital readiness with the telecom operators soon. Next question asked while talking on mobile when they have a bad connection, how long does it take before the call drops. 28% said it does not drop automatically at all and 23% said it takes at least a minute for the call to drop. 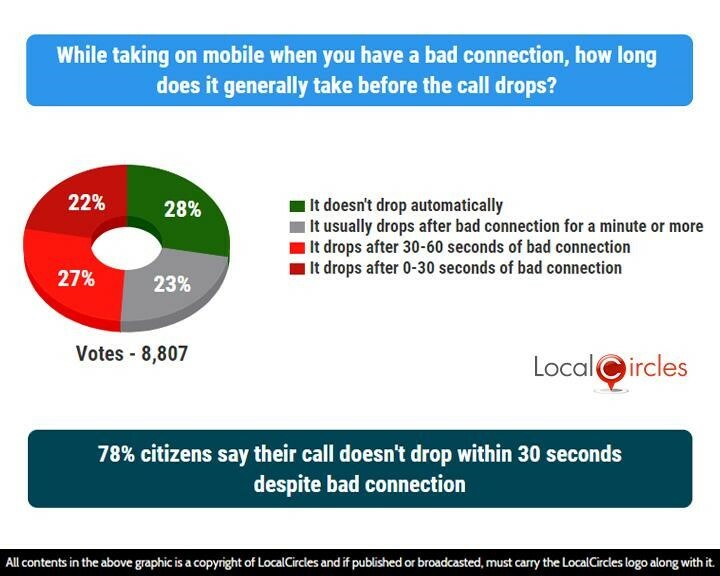 27% said the call drops after 3-60 seconds while 22% said it takes up to 30 second for a call with bad connection to drop. As per the latest report by Telecom Regulatory Authority of India (TRAI), except for Reliance Jio, other telecom operators failed to meet call-drop benchmark, in tests conducted on highways and on rail routes. People were also asked what also asked what their experience with Vodafone connections has been in regard to call connect and drop. 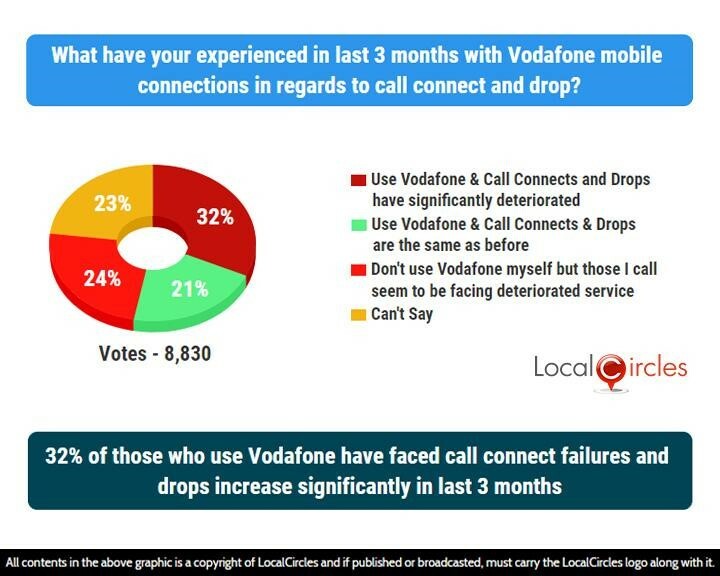 32% said they use Vodafone & call connect and drops have significantly deteriorated while 21% said they use Vodafone and call drop situation is same as before. 24% said they don’t use Vodafone but those they call seem to be facing deteriorated service. 23% were unsure about it. 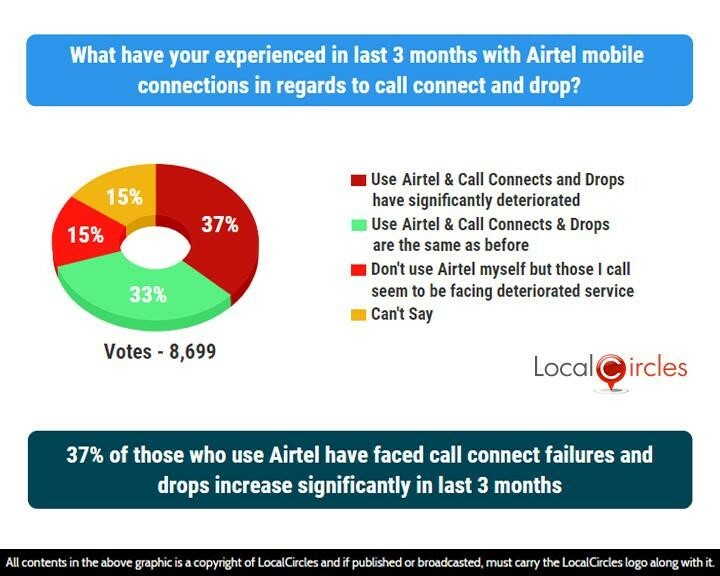 When it came to Airtel, 37% said they use Airtel & call connect and drops have significantly deteriorated while 33% said it is same as before. 15% said they don’t use Airtel themselves but those they call seen to be facing deteriorated service. 15% were unsure. Situation with Jio was almost the same. 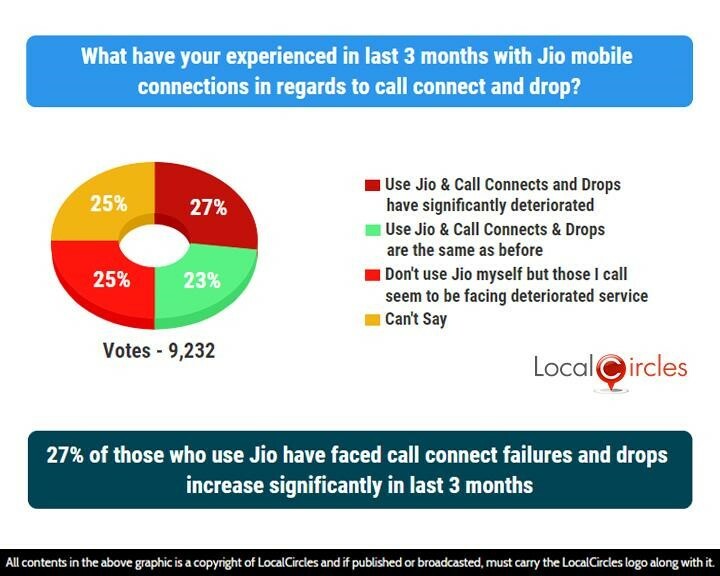 27% said they use Jio and the call connect and drops have deteriorated significantly, while 23% said they are same as before. 25% did not use Jio themselves but those they call have been facing deteriorated services. 25% were not sure about it. 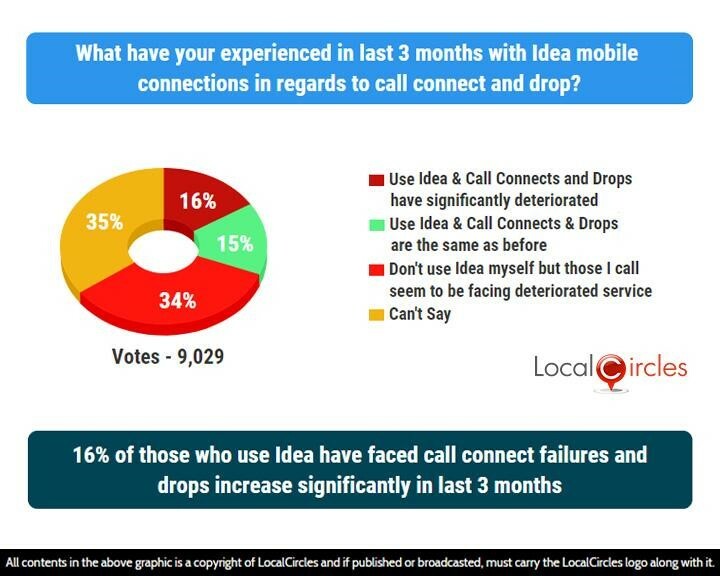 With Idea, 16% users feel the call quality had significantly deteriorated while 15% said the situation was same as before. 34% said they know others who use Idea and have face deteriorated service issues. 35% were unsure. 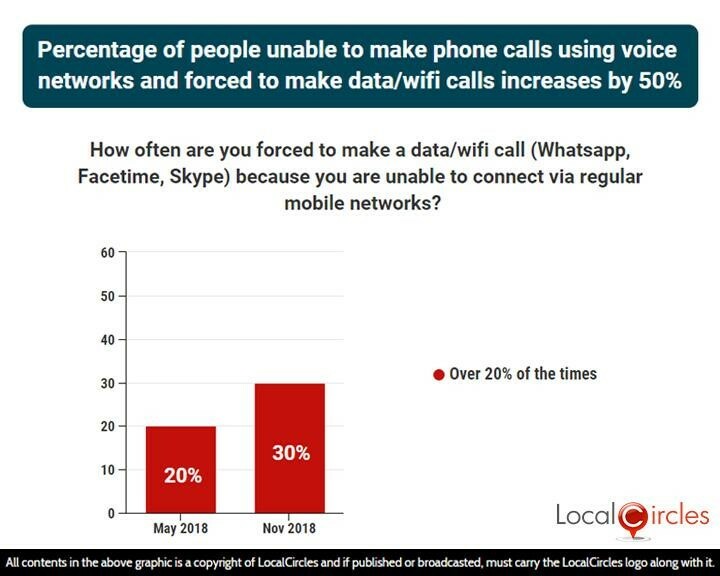 When asked how often they are forced to make a data/wifi call (WhatsApp, Facetime, Skype) because they are unable to connect via regular mobile network. 30% said they do it over 20% of the time while 26% said they do it 5-20% of the time. 26% do it less than 5% of the time while 18% never need to do it as their mobile network always goes through. The numbers are constantly deteriorating. 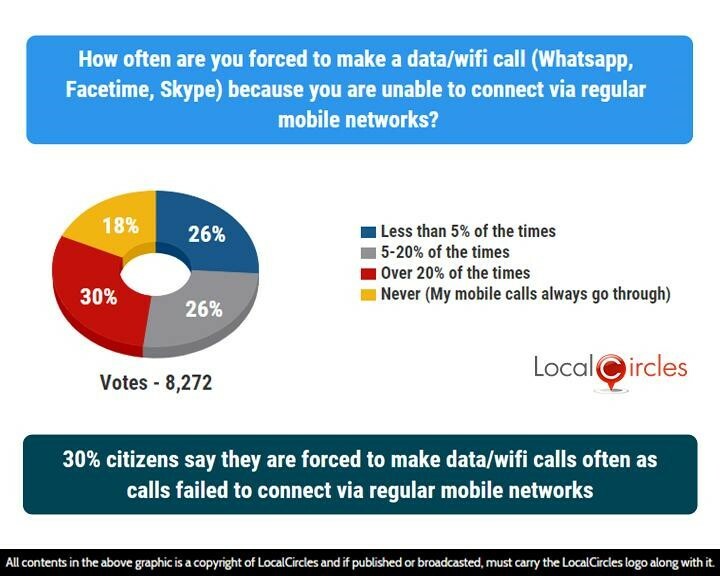 In May 2018, 20% respondents had said that they are forced to make a data/wifi call as they are unable to connect via regular mobile networks. In a 6-month time frame, this number has gone up to 30%. With the demand for data usage soaring, there have been acquisitions that the telecom companies are not investing enough in increasing the number of towers and in the 2G spectrum. 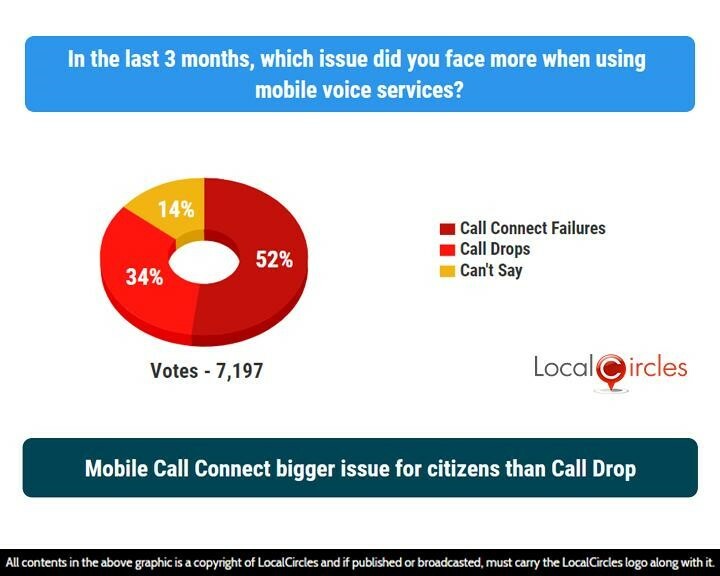 In the final question, 52% said that in the last 3 months they faced call connect failure the most while 34% said they faced call drops the most. 14% were unsure. India is a country with one of the lowest telecom rates in the world. These results point to the fact that low tariffs are not any good if the quality of service is not up to the mark. Connection issue not only frustrate the consumers, they also reduce the efficiency of how work is done. The government will have to take some harsh decisions to ensure that the quality of services provided by telecom operators in India is top class and no corners are cut to reduce tariffs. LocalCircles will submit the findings of this report to the relevant stakeholders like Department of Telecom, TRAI and any other Government departments who can play a role in improving mobile telecom services in the nation. More than 59,000 votes from 32,000 unique participants were polled from over 240 cities and towns across India. Approximately 31% participants were women, while the remaining 69% were men. 44% participants were from Tier 1 cities, 29% from Tier 2 cities and 27% were from Tier 3 cities and rural areas. 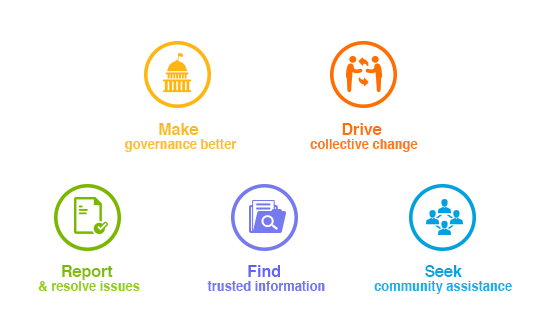 The above survey is based on the experience of the 32,000 citizens across India to assess state of mobile telecom services on an aggregate basis across the country. It is quite possible that the mobile service quality varies from location to location and the experience/actual data in one city for one service provider is of significantly higher or lower quality.